Most often I find that the client has plant material installed in conditions or areas that are not support its growth habit. Yes, that plant may grow, however, if you visit it within a few years and look at its density, growth habit and overall health, it is not achieving its full potential. As a rule, I’ll tell my clients, if can’t picture your property’s needs upon the first visit then this may not be a good project for us. 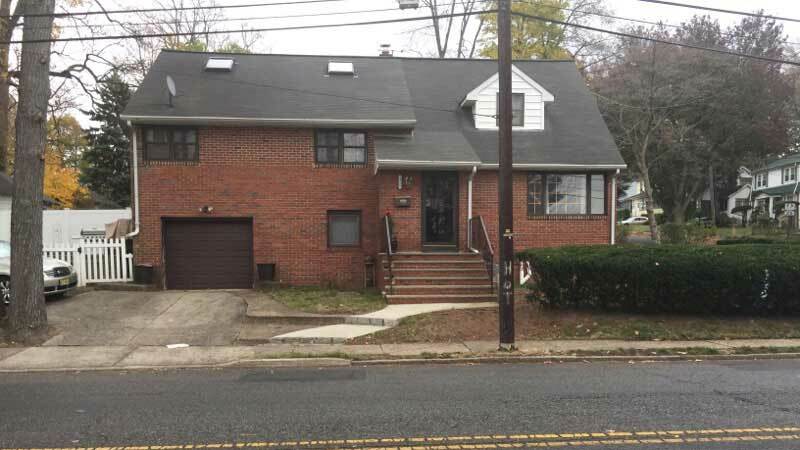 This residential setting fronting the street offer no curb appeal, had somewhat of a lawn area hidden behind a screening of taxus, and barren dirt areas close to the front entrance area. Basically it was just two beds to wrap and plant. The design could not get any simpler. The customer wanted the simplest design just to increase the visibility upon entering the home. The area to the right and of the front stairs is where we started. We had initially discussed removing the front border of overgrown taxus, however after the client considered that suggestion he decided he was just not ready at this time to undertake that idea. 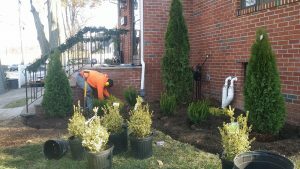 With regards to the beds at this residence, some of the plants we utilized were Emerald Green Arborvitae, Golden Cypress, Variegated Boxwood, Winter Gem Boxwood and the center piece, a Pom Pom Juniper. Usually one specimen plant (also called focal points) can be installed to create interest within the bed and be complemented by the other plantings. 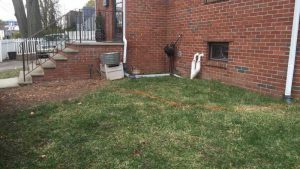 By establishing the foundation plants within these two beds, when early spring arrives there will be ample room amidst the plants to plant seasonal color and add some perennials into the mix. 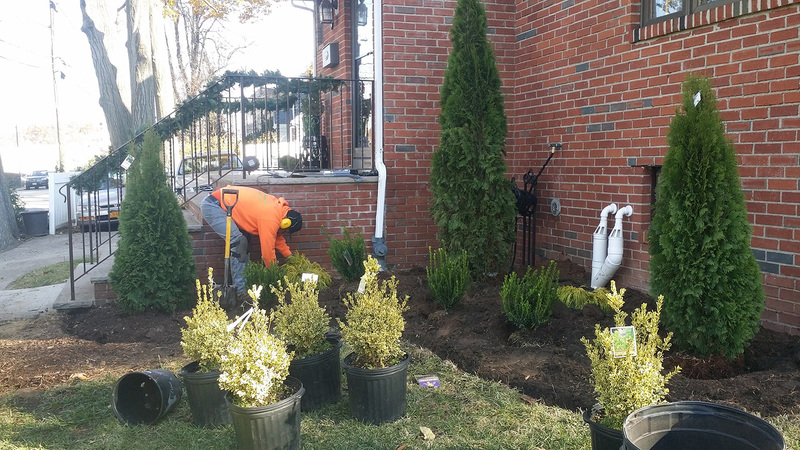 This landscaping project in Teaneck New Jersey was completed during the middle part of the fall season, which is an ideal time for landscaping projects. The cooler and wetter conditions in autumn call for less watering and that being, the plants will not have to deal with extreme heat. Cooler fall weather also means that there are fewer insects, weeds and pests to deal with. 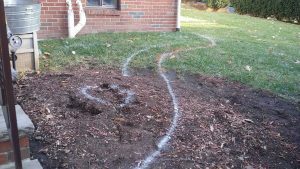 Also, although the weather is getting cooler, the warmer weather played a great part in keeping the soil warmer, providing an ideal planting environment for the roots to thrive and grow within. The warmer the soil, the more vigorous the growth. This in turn leads to a healthier plant the following year as deeper roots more effectively absorb plant nutrients that eventually turn into the flowers, the leaves and the fruit. Residential Landscaping Before - Non-existent landscaping with electrical boxes and A/C unit presenting and unsightly appearance to the property. 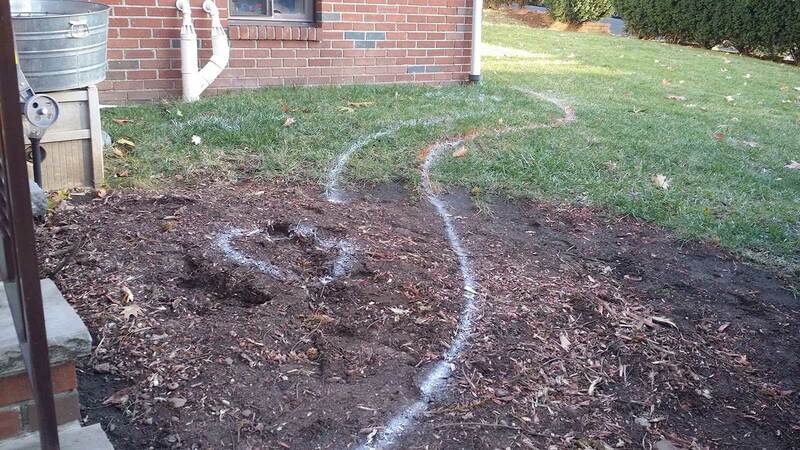 Residential Landscaping Layout for Specimen Planting - The landscaped bed is marked with spray paint detailing the flow and size of the bed to be planted. Residential Landscape Specimen Plant Design and Build - The planting of a diverse selection of specimen plants that complement each other and add visual appeal to the property's appearance. Arborvitae anchor the three corners of the bed with other shrubs blocking the view of the A/C and Pipes. 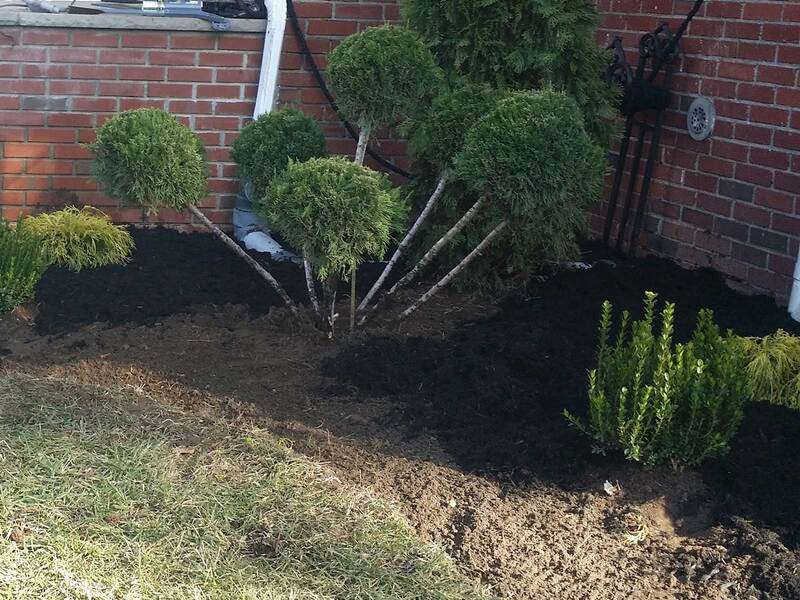 The plant we chose as the specimen plant to provide a focal point within the residential landscape bed was a Juniper Pom Pom Tree. A pom pom tree is a topiary, a tree or plant that is pruned into different shapes. Pom pom refers to a rounded spherical shape similar to a cheerleader’s pom pom or to the cut of a French poodle. There may be one or several spheres; the shapes are on a straight trunk. The standard is a pom pom that has one sphere. The tree or bush may also be shaped into round pom poms at the end of each branch. This cute, low-growing accent tree looks like a handful of giant green lollipops coming out of the ground, and it will put a smile on the face of all who see it. Approximately every three months, the new growth may be trimmed so that it stays inside the circular shape. Fertilize the tree during the growing season with a slow-release fertilizer per package directions. With a small garden shovel check the soil to a depth of 6 inches. If the soil is dry it is time to water. It lends itself well to formal landscapes, Asian-inspired gardens, and contemporary homes, but can be used anywhere you need a really special accent. They provide a classy focal point in the garden or in large containers in your outdoor room. Junipers are good choices, as they’ll hold their color all year, and their dense foliage makes it easy to maintain the shape with light pruning.